Myths from around the world tell of a time in earth's history when great civilizations and vast expanses of land were consumed by cataclysmic floods. Who were the people who formed these civilizations, where and how did they live, what happened to their cities and settlements and the lands they lived on? 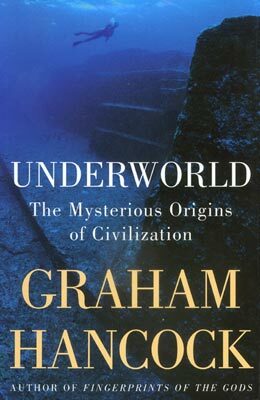 In his latest book, Underworld: The Mysterious Origins of Civilization (Crown Publishers, New York, 2002; 760 pages, photographs, ISBN 1400046122, hardback, $27.50), Graham Hancock explores these mysteries. Expanding investigations chronicled in Fingerprints of the Gods and Heaven's Mirror, he lays out evidence based on modern scientific research, comparative mythology, religious and spiritual observances, firsthand diving exploration of underwater megalithic structures, and ancient maps to demonstrate the likelihood that a technically advanced civilization unrecognized by modern science --capable of navigating the globe and with a profound understanding of architecture and building, astronomy, and geography -- existed before and during the last Ice Age and was wiped out by global flooding. Looking for evidence of ancient cataclysmic floods, Underworld explores up-to-date geological and climatological research on what may have happened during the last 17,000 years. Central to Hancock's investigation are inundation maps created by Dr. Glen Milne of Durham University which show vast tracts of mostly coastal land which were submerged by three waves of cataclysmic flooding between 17,000 and 8,000 years ago. The area of land -- the best quality habitable land of that time -- lost to the sea was huge: 5 percent of the earth's surface or 25 million square kilometers. While such maps cannot be 100 percent accurate, Hancock believes they are accurate enough to support his theories. Finding an accurate model of the behavior of the oceans during the peak meltdown period at the end of the last Ice Age (approximately 14,000 to 7,000 years ago) is difficult. Experts disagree over the sequence, chronology, and consequences of events, and even the terminology used. For the purpose of the Underworld inquiry Hancock uses the term "the last Ice Age" to refer to the period between 125,000 and 17,000 years ago; and the term Last Glacial Maximum (LGM) to signify the period between approximately 22,000 and 17,000 years ago when the ice sheets were at their maximum. At this time most of northern Europe and North America was under ice several kilometers thick, containing so much water that the global sea level was between 115 and 120 meters lower than it is today. Many areas of land habitable today were uninhabitable before the flood and vice versa, especially around low-lying coasts. The many cycles of the Ice Age correlate with the obliquity and precession of the earth's axis and the changing eccentricity of its solar orbit. These with other factors such as volcanism, asteroidal or cometary impacts, radical thaws and freezes, and geodynamic changes in the earth's crust or mantle are considered by science sufficient to explain the patterns of global glaciation and deglaciation. The effects of these forces were immense and devastating. The earth, like a huge sphere of gel, is malleable, and pressure on one area causes an indentation that forces the surrounding area to rise. Such isostacy occurs when ice caps weigh down on the earth's crust. When the ice melts, the pressure lessens and the bulge surrounding the indentation rebounds and eventually retains its original level. Thousands of billions of tons of ice weighed on the continental landmasses of North America and Europe at the time of the LGM 17,000 years ago. The water forming this ice came originally from oceans, so just as the ice pressed the continents down, correspondingly the ocean beds rose as the water burden above lightened. Although there is scientific proof from core samples and in the coral record that sea levels once rose very rapidly, the scientific majority still hold that the 120 meter sea-level rise in the last 10,000 years of post-glacial flooding represents a non-cataclysmic rising process of about one meter per year. Flood myths say differently, as do experts such as the late Cesare Emiliani, Professor of Geological Sciences at the University of Miami, and John Shaw, Professor of Earth Sciences at the University of Alberta, whose work, among others, Hancock draws on to form a synthesized theory. He describes the melting of the ice sheets, and ensuing floods and earthquakes unimaginable by modern standards. For instance, in Canada meltwater flooded around a giant ice barrier into Hudson Bay, the Arctic Ocean, and the Gulf of Mexico with a force of around ten million cubic meters per second -- enough to drain Lake Ontario in four days. 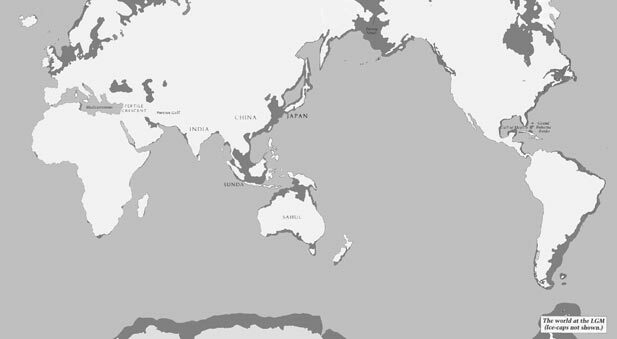 The world at the Last Glacial Maximum. Darker tint shows extra land above sea level. Research since the 1970s suggests that there were three global super-floods: 15,000 to 14,000 years ago; 12,000 to 11,000 years ago; and 8,000 to 7,000 years ago. The second period ties in with the date Plato ascribed in the Timaeus and Critias to the destruction by earthquakes and flooding of Atlantis, and with the Tamil myth of the submerging of the fabled land of Kumari Kandam. There is also strong evidence that nearly half the total meltwater released at the end of the last Ice Age was concentrated into these three relatively short periods. Such events would have had a momentous impact on the human inhabitants at that time, leaving a marked impression on oral tradition, the original transmitter of all ancient myths. Contrariwise, modern archeology tells us its story of civilized humanity based on numerous conflicting theories and interpretations of data, and scant material evidence from archeological sites covering a tiny area of the earth's surface, almost all of which are on land. Current mainstream thinking puts fully evolved humans on earth 100,000 years prior to the beginning of the first floods and cataclysms of around 17,000 years ago -- long enough for high civilizations to have developed. A dearth of land-based evidence is no proof that they did not. Land-based evidence does exist, however, although interpretation is one major barrier to realizing what it signifies. One main section of Underworld concentrates on India: its ancient inhabitants and spiritual traditions, specifically the Indus Valley civilization and the Vedas. Since the 1890s scholars have thought the Vedas were composed by Indo-European invaders -- the Aryans -- and codified by them around 1500 BC. This theory was almost entirely based on the misinterpretation of a few dozen skeletons found in the ancient Indus Valley. Another cornerstone of the now controversial Aryan Invasion Theory is the similarity between Sanskrit (the language of the Vedas) and ancient and modern European languages such as Latin, Greek, English, Norwegian, and German. However, in the last ten years the Aryan Invasion Theory has fallen apart. The generally accepted proposed codification date of 1200 BC, first established by Max Muller in 1890, does not signify either the Vedas' date or era of origin. Many researchers now accept that their composition lies long before in India's oral tradition and that they could be the creation of the Indus-Sarasvati civilization, inferring that there was a movement of language from India to Europe rather than from Europe to India. vibrant spiritual culture . . . raises the possibility that the real origins of civilization could be very different -- not driven by economics but by the spiritual quest that all true ascetics of India still pursue with the utmost dedication. . . .
Graham Hancock pursues these signs in ensuing chapters. The first of Underworld's many accounts of underwater expeditions begins in India as the author, collaborating with divers from India's National Institute of Oceanography (NIO), dives at the northwest coastal town of Dwarka, sacred to Krishna. Sunken ruins lie off the coast, but it is difficult to match the date of the archeology (1700 or 1800 BC) to the Indian traditional date of 3100 BC when ancient legend holds that Dwarka became submerged and Krishna's death commenced the kali yuga. Ruins dating to and before that time are found only in deeper water. Hancock and NIO divers also explored a mysterious U-shaped masonry structure at a depth of 23 meters, 5 km off Poompuhar in the Bay of Bengal. Inundation maps suggest that it would have been submerged about 11,000 years ago. Subsidence may account for this object's extreme depth, but without further research its origin, location, and purpose remain a mystery. Hancock also investigates the myth of Kumari Kandam, an antediluvian civilization said to have existed thousands of years ago around south India. It is believed to have been a great center of learning with magnificent academies which may have left a legacy of cartographic and astronomical knowledge which exists today in the ancient Indian texts. Interestingly, the author spoke to local fishermen who described often diving to free their nets caught on underwater temples with columns, pyramidal pagodas, and buildings with doorways. In the Postscript are details of the remarkable find in May 2001 of what looks like two underwater cities, one extending for 9 km underneath the Gulf of Cambay in North West India at depths of between 25 and 40 meters and at distances of up to 40 km from shore. Detected using side-scan sonar, the images produced reveal clear foundations to geometrical structures and walls rising 3 meters above the sea bed. Both cities lie along the courses of ancient rivers, and remains of a suspected 600 meter long dam have been discovered. Man-made artifacts have been retrieved by dredging, including what may be jewelry, stone tools, pottery, and figurines which carbon dating indicate are 9,500 years old. Inundation maps give the date of submergence as between 7,700 and 6,900 years ago, but the cities and culture that built them are likely to be considerably older. Another flooded kingdom Underworld explores is Malta. Among the many ruined monuments are the underground Hypogeum and the Gigantija, Hagar Qim, and Mnajdra temples. Conventional wisdom puts their construction somewhere between 5,600 and 4,500 years ago. All the temples contain massive stone blocks, weighing some 15 tons or more, and are thought to be the earliest free-standing stone monuments in the world. Mnajdra is a solar temple with accurate solar alignments incorporated into its design. The size and sophistication of these temples would imply that their architects and builders had long experience with such structures. It is generally accepted that man appeared on Malta somewhere between 5,200 and 7,200 years ago (when it was an island) and developed its culture gradually. The problem with these chronologies is that there is no archeological evidence on the relatively small island of Malta of "civilization history" documenting ever more sophisticated construction techniques. Anomalies surrounding many Maltese land and underwater temples, and a series of man-made grooves called "cart-ruts" cut into limestone bedrock on land and under water, all point to a mystery: who built these features and when? Malta is too isolated and small as it is now to have supported and sustained their development and construction. A solution lies in the inundation maps, which show islands of the Maltese archipelago connected to Sicily by a land bridge until 16,400 years ago, allowing settlers to arrive at Malta. The land bridge narrowed and eventually became submerged, leaving one large island which was finally inundated 10,600 years ago to leave the present group of Maltese islands. The inundation is undisputed by scholars; however, the chronology of settlement and its circumstances are. Hancock offers an alternative hypothesis: that there was a very long process of cultural development going on before and during the inundation on what is now Malta and the lands now submerged around the Maltese coast, with the rising sea covering up a large amount of evidence of a much larger civilization than current academic thinking allows. Curiously, the large island that formed as the Maltese land bridge drowned is featured on some maps drawn in the 1400s, and referred to as Gaulometin or Galonia leta, but it is the wrong shape and geographically misplaced, which is at odds with the usually accurately-represented Mediterranean region. Hancock suggests that what have previously been deemed by cartographic scholars as coastline and island-group inaccuracies around the world may actually be accurate accounts of coastlines belonging to epochs before and during the Ice Age meltdown period. It is well known that most medieval mapmakers were copyists reproducing older maps. Some older maps -- for example, those of Ptolemy -- were originally researched and drawn at the Library of Alexandria in Egypt. The author asks, "is it possible that he . . . was drawing on antediluvian sources," as it is known that Ptolemy based his maps on those of the Phoenician Marinus of Tyre, who in turn drew on even earlier mapmakers for inspiration. 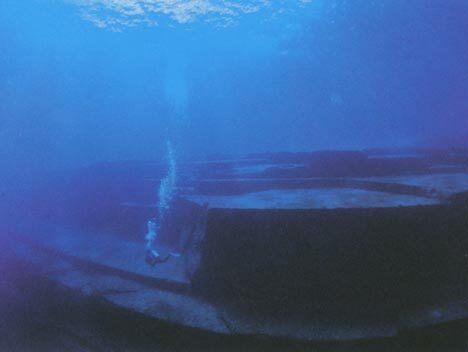 Hancock's complementary land investigation led him to encounter the Japanese Jomon people in an attempt to unravel the mysteries of four Japanese underwater sites: Yonaguni, Kerama, Aguni, and Chatan. It is unclear whether any of these sites are man made, although a case for human intervention is well presented in Underworld. The Jomon seem to have emerged suddenly in Japan around 16,500 years ago, as dating of their pottery attests. Archeology shows they had good architectural and building knowledge (incorporating astronomical alignment designs) as well as developed spiritual ideas and religious practices. The Jomon were not wiped out by invading peoples but merged seamlessly, it appears, with another migrating culture known only as the "Yagoi." Today's Japanese culture is the descendent of this ancient cultural merging, which implies that the Jomon culture and its ideas still live on. The underwater ruins exemplify a hitherto unknown and perhaps extraordinary phase in their history. Japan was not covered by an ice cap, had naturally precipitous coastlines and few low-lying plains, meaning that it largely escaped the ravages of the Ice Age cataclysms. If Japanese mythology is grounded in the myth-memories of the Jomon, it is not surprising that Japan has no indigenous flood myth. Underworld presents the idea that the Jomon lost their "beachfront" properties only, including coastal temples and other sacred and functional sites that now lie 30 meters under water. The recurring Japanese myth of the Kingdom of the Sea King connects closely with Japan's undersea ruins in two ways: that of the kingdom remembered as an island, and as an underwater sanctuary of walls, palaces, and mansions. In Hancock's words, "could it be a memory that great structures with 'turrets and tall towers of exceeding beauty' once stood above water but are now beneath waves?" (p. 594). The travelogue style of Underworld allows Graham Hancock to connect on a human level with the reader and to expose the many barriers to his work, such as bureaucracy and the lack of marine archeological reference material pertaining to underwater monuments. There are many examples cited of mainstream science skimming over important demonstrable facts and misrepresenting evidence relating to and synergizing mythology, religious and spiritual philosophy, astronomy, archeology, geology, and physics, for the purpose of keeping the established textbook theories of human and planetary evolution alive. Underworld challenges orthodoxy with well-thought-out arguments, in a warm, down-to-earth, and ever-optimistic although sometimes healthily skeptical mood, and the reader is often reminded that it is written not by an expert but by an investigative journalist who is not putting forth new dogmas but simply presenting the growing body of evidence that human history on this planet is much more complex than, and vastly different from, what was previously understood. Important, eclectic, and vast in scope, Underworld represents what the author appeals for in its closing pages: "research, research and more research," for the purpose of getting closer to finding our true origins.